Whatever happened to the sun goes down, the madness stops, people wonder why I hate Songkran so much. Most civilised parts of the country do stop the madness around 6PM. What's with leaving the sirens on the Plod vehicles to carry on wailing .. You wouldn't be able to hear a bloody word they were saying if they were asking you to go ..
And violence flared up .. Any surprise .? It goes too far when you can't go out to shop , eat or enjoy yourself without fearing of getting water chucked or sprayed over you .. And it goes on too long a couple of days are more than enough .. I used to think it was FUN before I had experienced it...now fir the first time I see it, can't stand it! Toilet water jetted into your face hundreds of times then inhaling cancer causing talcum powder. Now we're describing water boarding. Doesn't this latest display really want to make you bring your wife and kids to South East Asia's premier family resort? Why would any decent family not want to come and join in the fun? I have friends with kids who come especially this time of year because it is so fun. They love it. I trust they enjoyed Saturdays violence? Did they get to join in? Or maybe they were busy racing their modified put put? Those Police sirens really enhance the relaxed fun vibe don't you think? Thank goodness they are clamping down. Water fighting is supposed to stop at 6. I hate Songkran now. In 1980 it was respectfully observed in temples not the drunken lusting and drunkenness of today. I think you must have never experienced songkran. I have probably done more than thirty days in Pattaya, Samui, Phuket, BKK, Issan and the north. I have never experienced any violence. Just a few squirrel grips. You should get out and give it a chance. A lot of fun. Maybe you haven't. But clearly neither have you fully read and understood the article that you are commenting on so prolifically! I have also personally experienced many Songkran festivals, and thoroughly enjoyed them in the past. However the idiocy we see every year around Pattaya from Thai's and tourists alike is not my own idea of fun. The road accident statistics alone would tell any sane person to exclude it from their travel plans. Here in Pattaya quite simply the 'fun' goes on for far too long, and also has been hijacked by the idiot element. I dare say on Friday I will be out and about with Mrs Kim and my daughter for a few hours, and we will indeed have a good time, but most certainly will be nowhere near Pattaya Beach Rd, Pattaya's bar areas and the idiots that will be in them. Been there done it before, not interested. 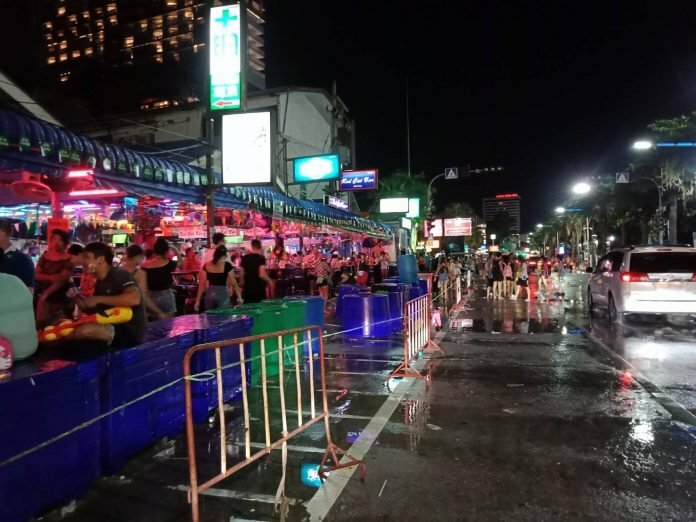 Maybe you think I am being negative about Pattaya's Songkran festivities, and if that is the case you should also hear the opinions of Mrs Kim and our 11 year old daughter, they make my rantings pale into insignificance. This used to be the rule in Pattaya many moons ago, all water throwing stopped at 18:00hrs so other businesses could make money; no-one want to go out for a meal and be soaked before getting there, bring back the time limit and I agree two days is long enough to be wasting water...! !